Putin@war: Something is still going wrong with the border crossings? Something is still going wrong with the border crossings? On Jun 26th we reported about the progress Ukraine made in retaking the border crossings. Up to four sizable companies are patrolling the borders. On July 3rd we reported how fighting was going on near Izvarino, but still large convoys were able to cross the border north of Izvarino. 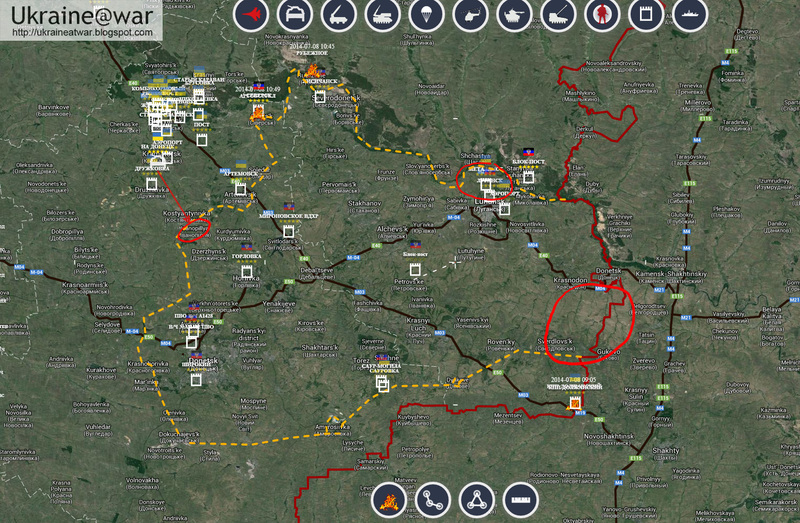 On July 4th we reported about 6 tanks spotted in Krasnodon probably going to engage the Ukrainian company that was operating near Izvarino border crossing. Since then we have not heard much, but once in a while a messages came in. So probably the air force saved them? Yes, it seems like that. Thoughts @hrw & @TanyaLokshina? "@lennutrajektoor:...#RUS truck w... howitzer didn't make through #Izvarino BGCP.... pic.twitter.com/Vp0kpWPYpf"
This is the only photo we have seen for days and it gives the impression Ukraine is still quite in control. Now Baby@Truth_seeker ia a (pro)Russian account and as such NOT reliable at all. He uses a photo that was taken three days earlier. But it doesn't mean that always everything they say is a lie. So there might be a problem here. The photo of the tank is taken in Irak in 2003. The story really sounds far-fetched and the evidence given is faked, so it can not be taken serious. These Russian sources all copy each others propaganda lies so it is hard to say something senseful about it. The other sources may go back to this interview. We may have to take this message serious. Of course if it is true, it is bad news. When the borders are not closed reinforcements will still pour in. If this is really a meaningful event remains to be seen. The border crossing are mostly abandoned and not operating. So if either side checks for activity once in a while it does not mean they have it in control. The real question is where the Ukrainian companies are and whether the road is accessible/usable or not.